In Calcutta (Kolkata), in the Northeast of India colourful fabrics are made out of waste cotton from the textile industry. In small villages around the big city Calcutta, several women are weaving new fabrics out of waste materials. These fabrics are used to make colourful bags and accessories. 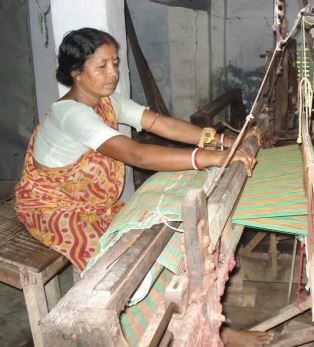 In small villages near the city of Calcutta are different small family factories run by women. They are weaving new fabrics using waste cotton from the textile industry. These colourful fabrics are fabricated into bags and accessories by our production partner in Calcutta. About 20 women get a fair wage for the work they do for Ragbag. Take a look at the movie to see how the bags are made in Calcutta. In Calcutta, these women are working to make beautiful bags of recycled textile. 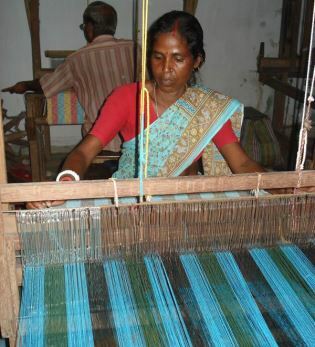 They use traditional handlooms to weave new fabrics using cut-offs and waste textiles from the fashion industry. Click here to go to the Calcutta collection.